I am almost embarrassed by how easy this dish is to prepare. Almost. I could lead you down the path, recounting how I soaked the navy beans over night and slow cooked the beans for hours in a treasured “Boston Bean Pot.” The venison sausage? Sourced from the Merritt Parkway a mile past exit 42. The Chili? From a sacred recipe handed down thru the generations in my family… first made on the back of a Conestoga wagon when Old Jed Fleischner traveled from Ellis Island to New Haven. I could tell you all that… but it just ain’t so. The venison/pork sausage I ordered online from the Cajun Grocer in Louisiana (I get turduckens from this outfit, too)… the can of Bush’s Grillin’ Beans (Black Bean Fiesta), made in Tennessee, but available in just about any super market (by the by… if there was a Nobel Prize for food… Bush’s Grillin’ Beans would win). Hormel Chili is from Austin, Minnesota not Texas, it works in this recipe. Remember… KISS… “keep it simple stupid”. Lastly, sliced Vermont White Cheddar from Sargento, a Wisconsin based Company. Other than the sausage, everything is easily found in your local market, whether you live in a “RedState” or not. I have made this dish three times. Each time a bit different… changing types of sausages and würsts based on mood, or what’s in the fridge. Please note… that if my pantry drops below 6 cans of Bush’s Beans our home goes into DEFCON-4 alert. My favorite remains the Black Bean Fiesta recipe; but the others would be fine. And wine for this “hodge podge” dish? A cockamamie “field blend” wine from California. It’s a perfect juicy style of red that complements this dish to a “t”. I never tire of these types of “field blend” wines. And what’s more, it appears that talented winemakers love the challenge of bringing together disparate varietals into a harmonious blend. These wines share an “attitude” of fun… a unique blend of grape varietals that changes vintage to vintage based on success in the vineyard. In this case the source for this wine is a single un-irrigated vineyard with vines that range in age from 40 – 70 years. Made from a “hodge-podge”of grape varietals from gnarly-looking bush vines that naturally produce tiny yields. The resulting Marley Bush Vine Blend is a succulent red… a blend of Syrah, Zinfandel & Dolcetto, the right amount of time on in oak to balance out the fruit and it drinks like a dream. This is the kind of wine that flows, you open one bottle and before you know it you will be opening another. It’s that type of wine! Rich and lush, superb black berry on the bouquet, toasty oak, Asian spices and kirsch. The wine has a great nose. Raspberry, blackberry and chocolate notes emerge on the palate and lead to a long, fruit-filled finish. Enjoyable now, this hedonistic opulent red will continue to provide pleasure through 2018. The style of this wine will make it a great “house red”… perfect for Fall and Winter entertaining. 1. Put gin and vermouth into a glass pitcher, fill with ice, stir vigorously while incanting, “You who know all, thank you for providing us juniper and all the other obscure ingredients responsible for creating this sacred liquid!” Strain into a pre-frozen Martini glass of admirable size. Skewer the olives on one of those tacky cocktail swords, place in glass. Immediately begin consuming. Now you can begin the food prep, and the cooking! 3. Heat sausages and würsts in a skillet, flipping occasionally 3-5 minutes. Put beans into pot over medium heat. When sausage/würst is cooked, drain and add to the pot with the beans. Mix thoroughly, and cook for another minute or so. 4. 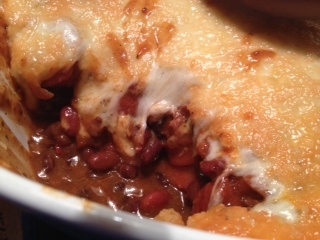 Put beans and sausage mix into a casserole. Spread the chili over the mixture, making a separate layer. Layer the cheddar slices over the mixture. Use the entire package to create a thick “blanket” over the mixture. 5. Put into the oven for 10 minutes. Then switch oven to broil. Broil the casserole ‘til the cheese topping turns a deep golden color. n.b. There can’t be an easier dish to modify than this one. Don’t fret about the “sausages”. Andouille, chorizo, bratwurst, hot dogs & just about “anything”. It’s a function of what you have on hand and how spicy you want the end result. I like a mix of textures and tastes. Hormel also makes a spicy Chili. It would work, too. Smokier taste? Bush’s does a “mesquite” recipe that would be great. Also… I added no additional seasonings… but I can imagine that chili powder, red pepper flakes, or hot paprika would add extra dimension of “heat” if that’s a preference.